We've seen 'buy points' Flash Sales from several other programs like Club Carlson and now it's Choice Hotels Privileges turn! For only 8 hours today and on Wednesday you will get a 50% bonus when you buy Choice Hotels Privileges points. 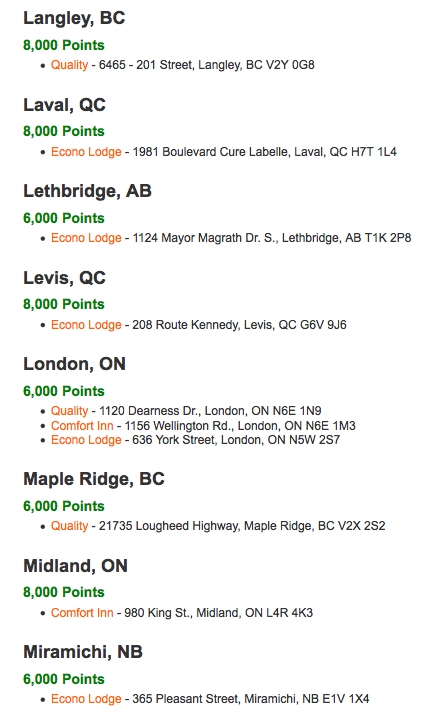 Normally the points cost $11 per 1,000 points which means you'll get 1,500 points per $11. With free nights starting as low as 6,000 points at some hotels you could have your stay for $44 plus taxes/fees with this promotion! Click here for a complete list of the Canadian properties at the lowest redemption levels. For 8 hours only, receive a 50% bonus when you purchase Choice Privileges Points (up to 50,000). This offer is only available between 9:00 a.m. - 5:00 p.m. ET on Monday, Oct 20th and Wednesday, Oct 23. Buy online now.